The art of calligraphy is transformed into a dynamic abstract form when Peter Furlonger applies it to sculptural glass. His exceptional work involves engraving textured lettering onto three-dimensional glass using a sand-blasting technique. Furlonger has developed his artistry since receiving a commission for a piece of glass to be exhibited as part of the Gateshead Garden Festival in 1990. Since then he has come to work in collaboration with virtuoso glassmakers to produce exquisite individual pieces, including cylinders, bowls and roundels. A glassblower such as the Isle of Wight’s Carl Nordbruch creates a piece to Peter’s specifications and it is onto this ‘canvas’ which calligraphy is engraved. 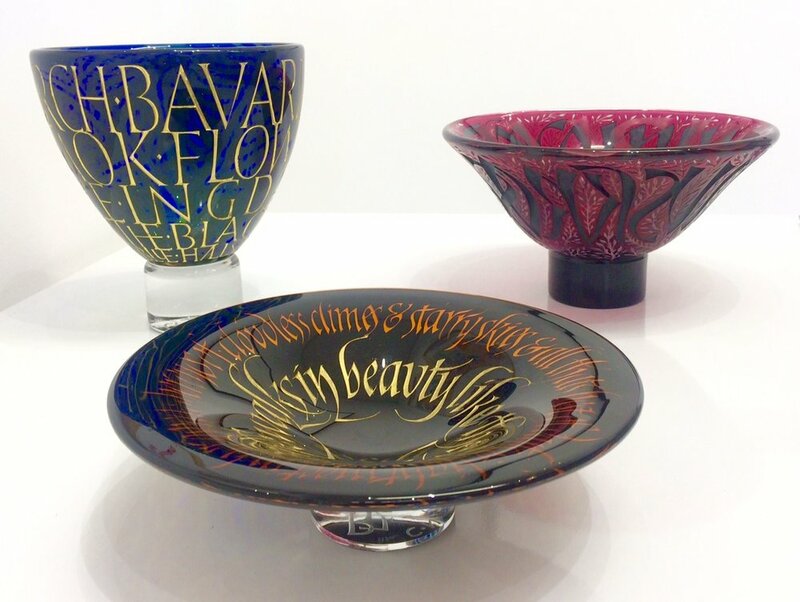 Work by Furlonger is highly sought after by collectors and is held in the Victoria & Albert Museum, the National Museum of Scotland, Sunderland Museum & Winter Gardens, and North Lands Creative Glass, Caithness and by the British Glass Foundation.